"OPI’s autumn range, the Holland Collection features wooden shoes, pickled herring and tulips; a juxtaposition of sophisticated neutrals married with larger-than-life bright shades.. the Holland Collection is not only filled with quirky names inspired by the Netherlands, the collection features desirable blues, rich plums, sea foam green, red clay, neutrals, pinks and bold oranges that capture the energy of this clog wearing nation. Picture fields of vivid tulips, windmill-dotted along the hillsides and bustling canals, OPI’s Holland collection offers an assortment of vibrant brights combined with sophisticated neutrals. The varied palette of colour shades complements the fashion displayed down the runway, from colour blocking pants and skirts to feminine free-flowing dresses and blousy-sleeved tops and dramatic patterns." Pedal Faster Suzi is a sheer lavender pink with silver and pink microshimmer. It's just gorgeous! 3 coats is pictured. Did You 'ear About Van Gogh is a sandy-beige creme. I'm really getting into these sorts of colours and this is a great neutral shade. 3 coats is pictured. I Don't Give A Rotterdam is a sheer dusty blue with silver and gold shimmer. It's a really lovely blue! 3 coats is pictured. 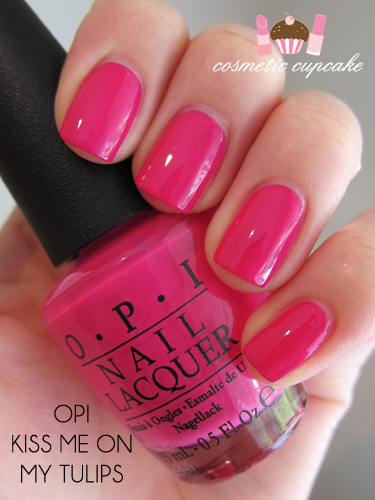 Kiss Me On My Tulips is a hot pink creme. 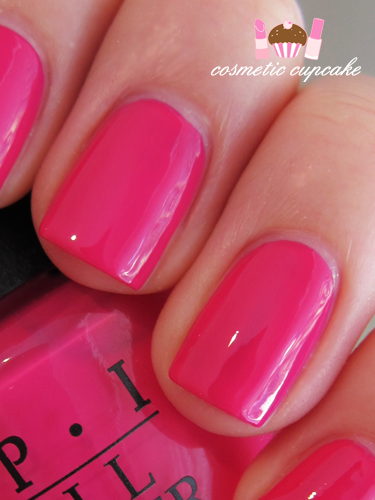 It is SUPER bright and makes a perfect pedi colour. 2 coats is pictured. Gouda Gouda Two Shoes is an unusual colour - OPI describes it as a "robust rose" but I don't think it looks anything like rose! With the help of wikipedia, I'd say it's an orangey russet colour with a very subtle gold and bronze shimmer through it. 2 coats is pictured here. Overall: The Holland collection is a fantastic Autumn collection. The shades are perfect for this season (apart from Kiss Me On My Tulips which is a bit bright for an Autumn collection personally) and are very wearable. They had excellent formulas and as usual the Prowide brush was great to use. I did experience some dragging with them but I don't think I waited long enough in between coats. They all dried to a very glossy finish and dry time was excellent. All were 3 coaters apart from Kiss Me On My Tulips which was the most pigmented polish. My picks from the ones I tried are I Don't Give a Rotterdam and Did You 'Ear About Van Gogh! Details: The OPI Holland Collection is available now at selected beauty salons, spas and David Jones nationally for $19.95. 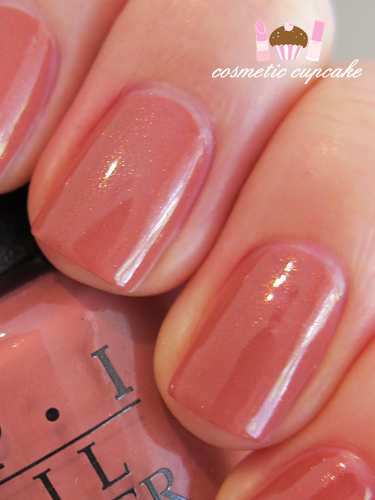 Have you tried any of the polishes from the Holland collection? What colours take your fancy? Thanks for looking as always! Thank you Rin! 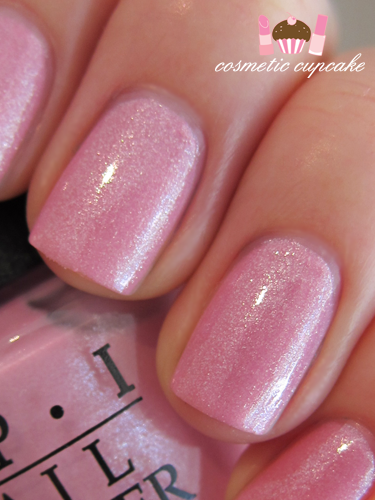 All I do is slather my cuticles in cream ;) I adore hot pinks too! I've been wearing Kiss Me On My Tulips on my toes for so many weeks now hehe. This collection has some really interesting and unique colours! I love them! It's more of a Summer colour than Autumn colour really. Still great to wear brights in the cooler months though! This collection looks gorgeous! I love I Don't Give a Rotterdam. It's a really unique colour. Glad you like it too! I had to look up what a broodje kroket is lol. It looks DELICIOUS! But I love stroopwafels hehe. Which polishes did you get Marte? Awwww that's very sweet of you Elisa! I hope to go one day hehe. What colours do you associate with the Netherlands? And you should eat suikerbrood! Anyways the collection looks beautiful! 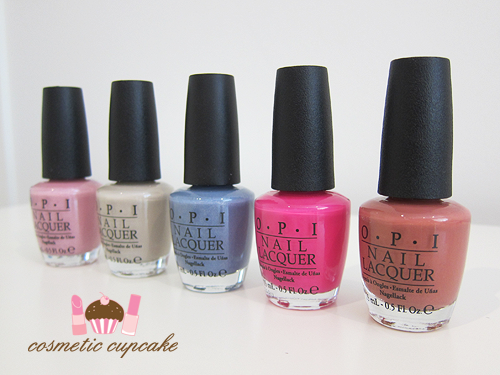 Ekk this is prob the first OPI collection where I could die for every single colour.. these are gorgeous! I cant decide a fave.. way too hard! Lol I find it's always hard to pick a favourite colour from a collection too Lucie! Thank you lovely =) Oh no I didn't know that!! I actually received both and love them both so I should do a comparison. LOL I love pink too ;) I don't really like GGTS on me..
Awwww thank you Su! The pinks in this collection are really wearable. They'd be great for all seasons too! I would have had them up sooner oops! I'm glad to hear they're useful for you =D Those are excellent choices btw! wow that baby pink is a real stunner! !